Kirton rider Ben Wilson recorded two strong results in round nine of the British Supersport championship at Oulton Park over the weekend to move him up into eighth position in the rider standings. Qualifying went well for the Lincolnshire ace who began Saturday’s sprint race from the middle of the third row. As the 12 lap affair got underway Wilson settled into seventh place just hanging off the back of the leading six bikes, but as the race wore on he lost touch with the front runners and on the penultimate lap was circulating some five seconds behind them. On the final lap Kyle Ryde crashed which moved Wilson up a place. He crossed the finish line in sixth place to pick up 10 championship points. Starting the feature race from the second row Wilson got away to a quick start and was fourth as they rounded Hall Bend for the first time. But he could not hold his position and was relegated to sixth at the end of the first lap. He remained in sixth place throughout the race but once again dropped back from the leading group as they upped the pace. He looked to have sixth in the bag but the leader crashed on the run to the chequered flag which gifted Ben fifth place and 11 championship points. 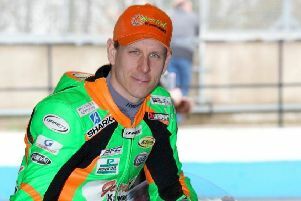 Wilson said: “I really like the Oulton Park circuit, it’s a real riders’ track and suits me down to the ground. These two results elevate Wilson up to eighth in the rider standings on 124 points and he will be seeking two good results in the next round at Assen in the Netherlands over the weekend of September 18-20.